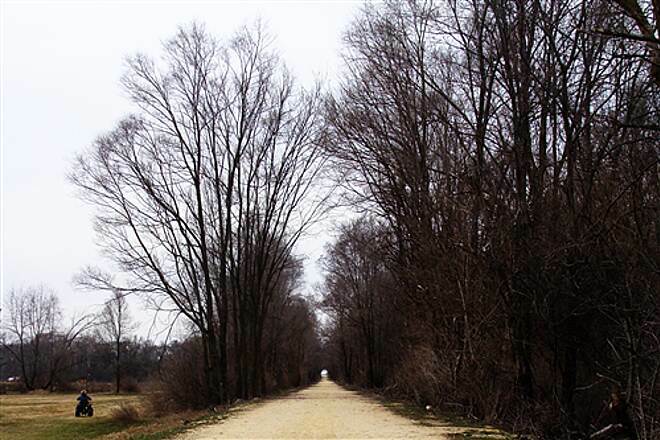 Built on a former rail bed dating back to the 1850s, the Stone Bridge Trail provides a crushed limestone pathway through rural countryside. 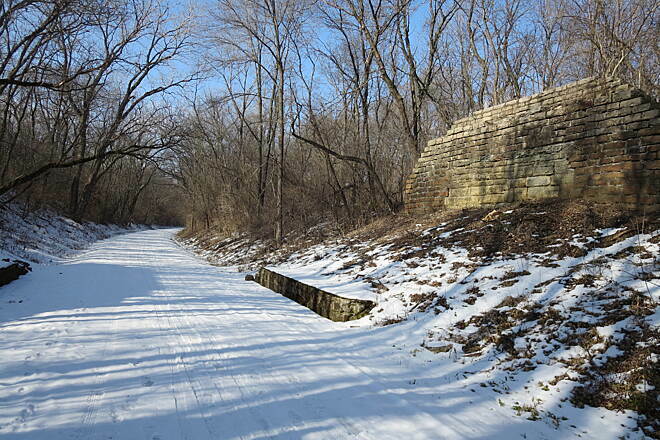 A highlight of the trail is passage on Stone Bridge over the scenic South Kinnikinnick Creek. 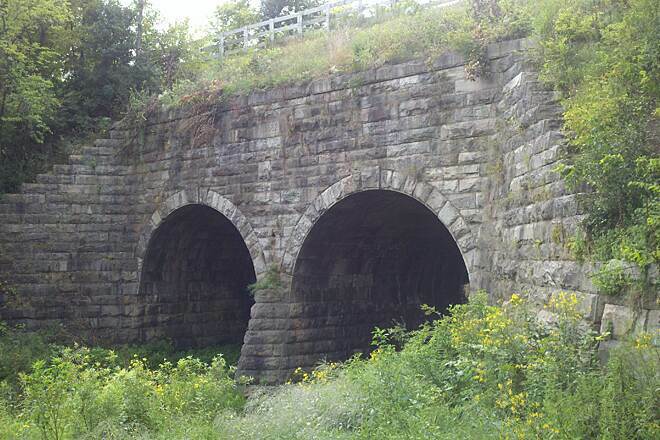 Built in 1882, the double-arch bridge is included on the National Register of Historic Places. 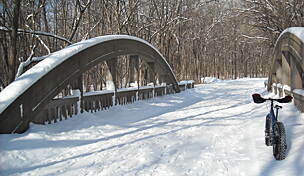 The trail passes both the Stone Bridge and Roland Olson Forest Preserves. 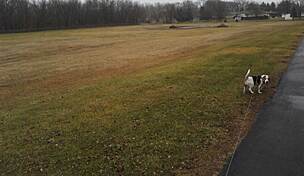 The latter is more developed, offering athletic fields, picnic tables and restrooms. 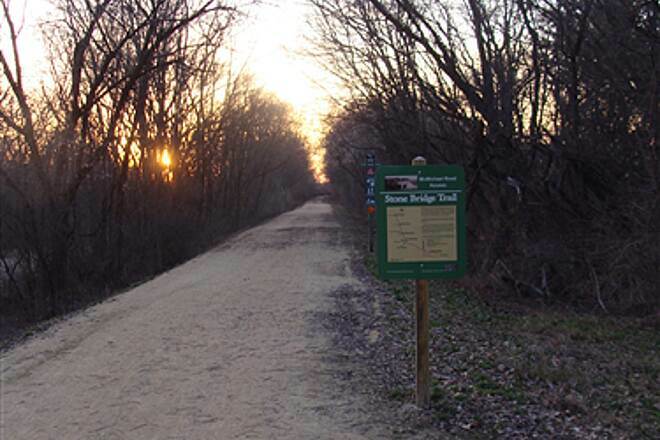 On its eastern end, the Stone Bridge Trail connects to the paved Long Prairie Trail, continuing the journey through gently rolling hills, wooded areas and farmland. 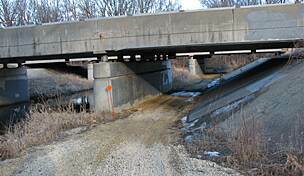 To begin at the west end of the trail, exit I-90 at Rockton Road and go west about 1 mile to the trail entrance on the south side of Rockton Road just before the State Route 251 overpass. Parking is available for about 15 cars. To begin at the east end of the trail, exit I-90 at SR 173 and turn right (east) on 173. Travel about half a mile to the light at Belvidere Road, then turn left. Proceed 0.75 mile to Atwood Road. 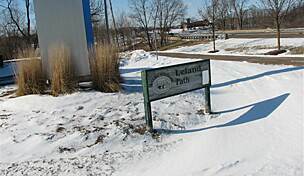 Turn right and go about 0.25 mile to the Roland Olson Forest Preserve entrance. At the park entrance, parking is available for 10 cars. my wife and i took part of the trail the previous week but we finally went the length of it this past weekend. beautiful trail and we'll definitely be riding this more often. Yesterday was my first ride on the Stone Bridge Trail. It had rained for 2 days prior, so I didn't really know what to expect. The trail was in excellent condition. 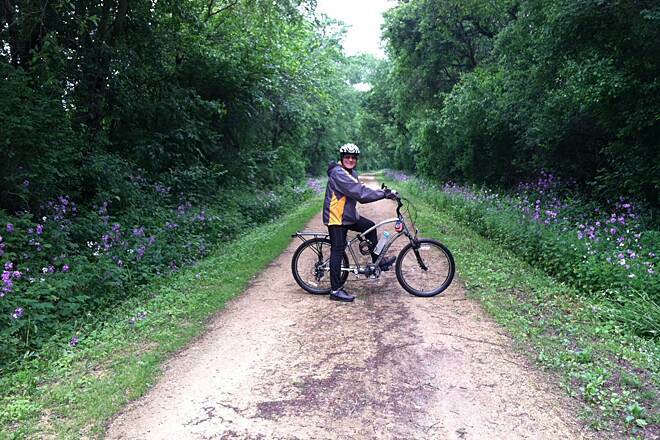 I started at the Rockton Road trailhead and rode to Poplar Grove (via the Long Prairie Trail). There were a few spots early on where some small animals have burrowed in the trail creating some small holes in the trail. Apart from that, it was smooth sailing. There weren't any washout spots even after all the rain. I wasn't really sure where the trail ended and the Long Prairie Path began, but it became obvious once I found myself riding on pavement. This is a really great trail. Very well maintained crushed stone. I rode from the Rockton Rd. 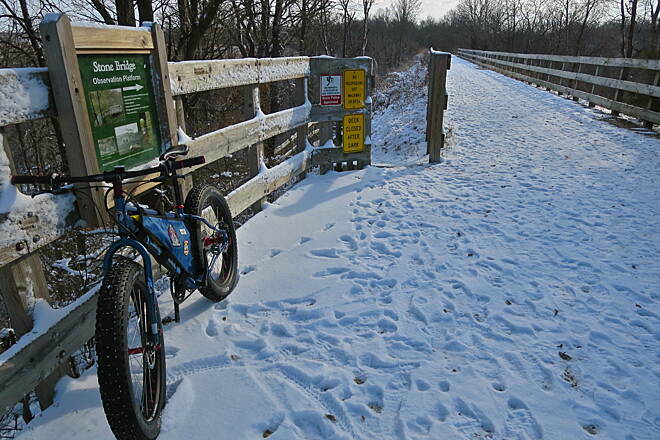 trailhead to the Boone County line (where the trail continues as the Long Prairie Trail for 14 more miles) and back. The was the nicest bike ride I've had all year. If you go on this trail I highly recommend stopping at the Stone Bridge and walking down the zig-zag embankment trail to the viewing deck for the bridge. 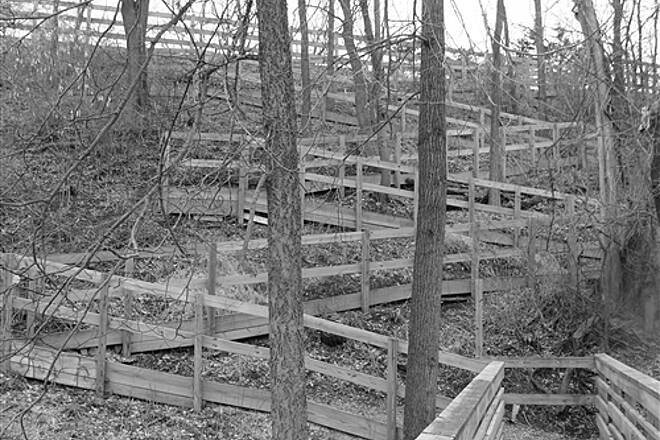 You have absolutely no idea that this marvelous structure is there when you cross the top on the trail as it is totally hidden by the berm construction. The engineering and construction is awesome; seemingly out of place in this rural setting. Excellent trail to ride on. Crushed stone trail but it is really smooth. A lot of shade that makes it nice and cool on hot day. Also a ton of wild flowers along the way. We also saw a family of wild turkeys along the way. Highly recommend this trail to anyone in the Northern Illinois area. 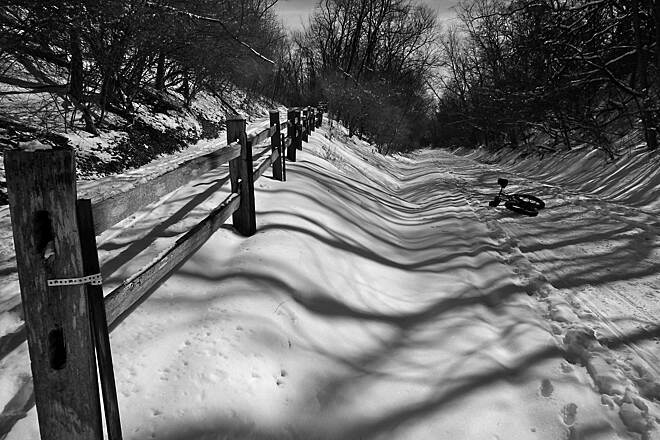 A very well-maintained bike trail. Must stop at the poison ivy Pub for Refreshments after the ride. The lot on Rockton road is great. 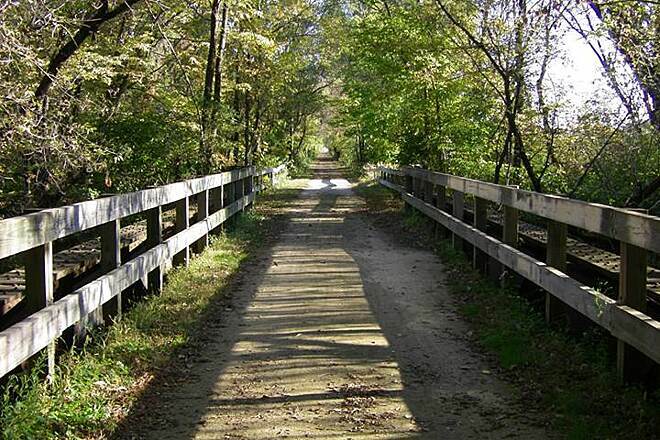 You can extend your ride into Boone County on theor very nice paved trail as well. We always enjoy this one, particularly for a social easy breakfast run. Smooth, a lot of shady spots, and scenic. 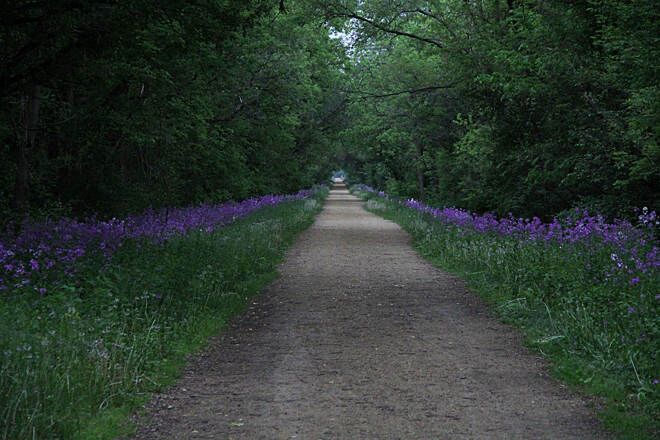 Start on Long Prairie at Caledonia, and ride to Poison Ivy in Roscoe. Great food and unique, fun Bloody Mary's! 15 miles of fun ride for couples! You can get more aggresive and tie in Long Prairie. Love these trails! For those heading out, the trail is a bit bumpy and rutted, and the underpass at I-90 has been "repaired" with a fresh layer of loose gravel. Nice. Not. I expect the conditions to improve as the season progresses. 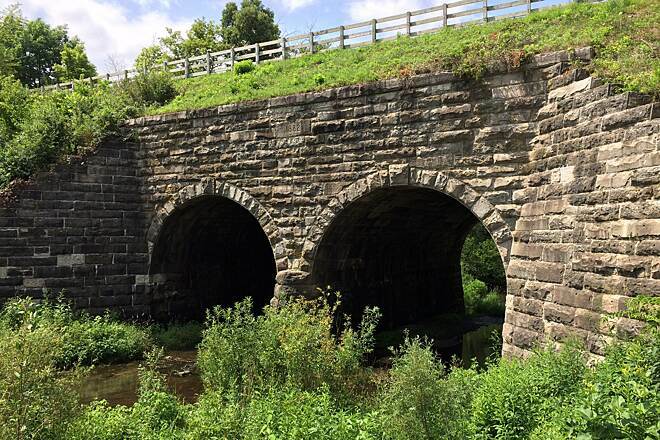 Stone Bridge is one of our favorites. 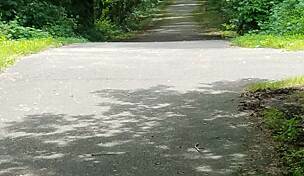 Not only is it scenic and well-maintained, but it connects to several other bike paths of various lengths. First of course is the 14-mile Long Prairie (paved) to the west. 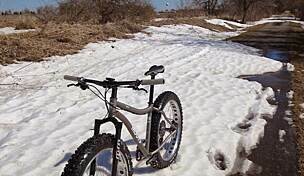 Next, just north of where the Stone Bridge Trail crosses Elevator Road, there is the short Kinstone trail (gravel) to the west which will take you right to the Hononegah Rec Path (paved), on which you can ride from Roscoe to Rockton along Hononegah Road. 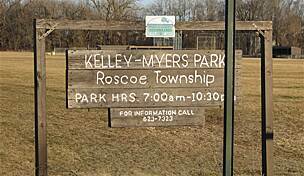 At Hononegah Forest Preserve, you can access the very short Kelley-Meyers Trail (paved) which takes you to the park of the same name. 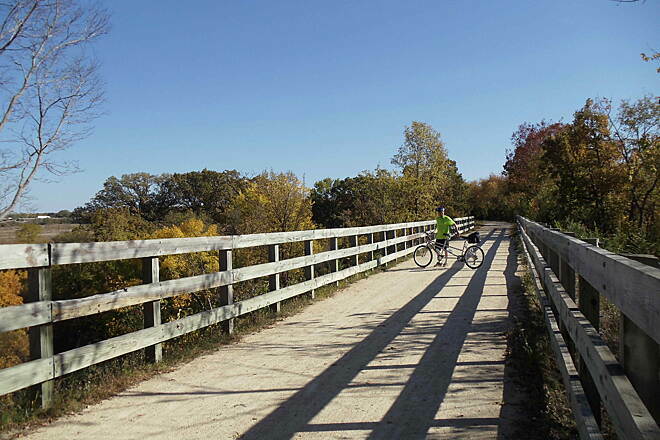 Although we have not yet fully explored that option, we understand that you can THEN access the Dorr Road bike path (paved) which runs north to South Beloit. So on this network of trails, you could start east of Capron, IL, and bike all the way to South Beloit. And I should also mention the eateries along the way, namely the Poison Ivy Pub at Elevator Road, and many others along Hononegah Road. One of the best, if not the best, running trails in the area. The crushed stone is easy on the feet and much of the trail is shaded by trees. It connects to a few different running paths, so you have options for mixing up your run. There are a few roadway crossings. You can really make a long run out of this trail. 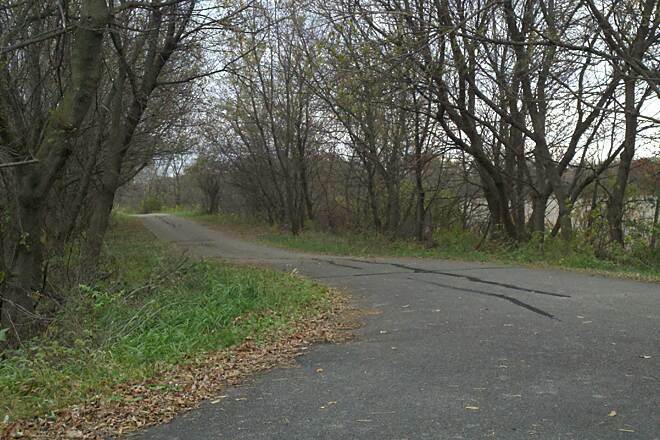 I have run this trail from its beginning at Rockton Road to Long Prairie Trail (switches to asphalt) all the way to IL 173 and BACK. It's quite the trek! I prefer to start at the parking area at Rockton Road, but you have options for doing different sections. There's even an entrance to the trail on Tybow Trail (a subdivision). 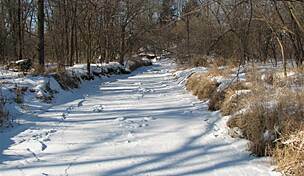 Make sure that you look around for evidence that this used to be an 1850's railroad line. You'll see things if you look! I hiked the length of the trail and back 12-12-11. The dog and I both had a good time. I posted a bunch of pictures and video on my blog. This was a longish hike for us. 11.7 miles per the GPS track. Just under 6 hours. We had nice cool weather. It started out in the low 30s and edged up into the low 40s. 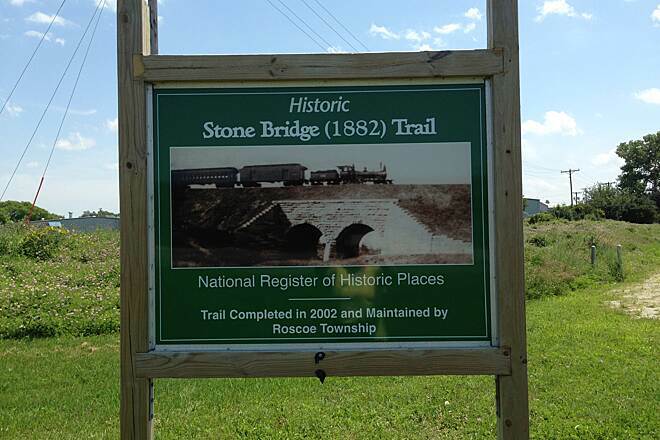 We passed by Stone Bridge and Roland Olson FPs, and turned around when we got to the Long Prairie Trail. It is an easy walk, not much grade change. It is an old RR right of way and trains don't like much in the way of grade change. The surface is an easy walking crushed stone. It was a Monday morning. I did not expect much traffic. We ran across maybe a dozen people on foot, most with dogs, and another half dozen or so on bikes. The trail surface is about 10 feet wide, with 20-50 feet of buffer on either side. Much of it is hardwood, some is prairie. Much of the trail abuts residential areas so it is sort of like walking through people's back yards. The trail often has deep gullies along side it, sometimes exhibiting a 50 foot drop or more, and in one section there are 10-30 foot high berms on either side. I did not notice much in the way of facilities along the way. 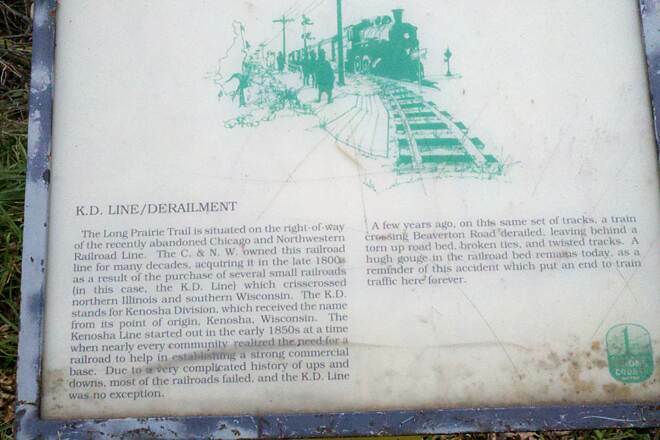 A bench at Elevator Road, and a well and outhouses at Roland Olson FP were about it. There were also benches at the observation deck at Stone Bridge. There are 19 parking spots at the Rockton Road access point. About the same at Roland Olson FP. You probably could park in the Roscoe Township offices at Elevator Road as well. None of the other access points had any parking. We passed over 4 or 5 creeks. Wilma wanted to visit them, but there was not any real convenient access. Maybe next time. A beautiful, smooth path. The surface is very finely crushed gravel and dirt - no problem with traction even for a bike with street tires. 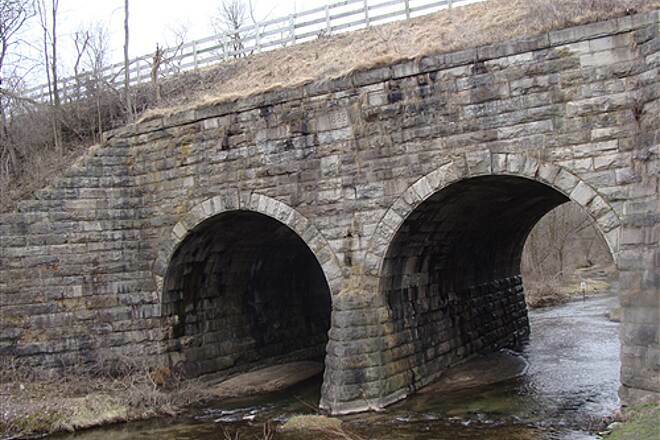 The stone bridge, which is on the National Register of Historic places, is a must-see. There is a long, zig-zag walkway down to an observation deck to view it. Don't turn off your heart rate monitor - the trip back up will get your blood pumping! Many parts of the path are very well shaded. There is a very slight upward grade that starts about 1/2 mile away from the trail head on Rockton Rd. that goes quite a distance - something to be aware of if taking a long trip. I prefer to start at Rockton, so my return trip is a little faster and easier. 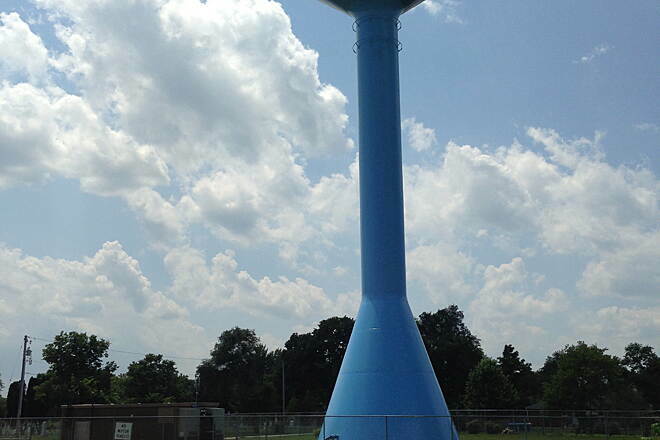 Just did a ride from Rockton to the Long Prairie trail, through Caledonia, then a quick left on Fairgrounds Rd. to the Boone Family Restaurant - 12 miles. Food, rest, then headed back. Very doable, even for a beginner like me.